1949 vintage wedding bus hire. 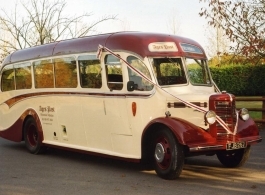 This 29 seat Bedford Charabanc is in immaculate condition and is a unique vehicle for your special day - viewings are recommended prior to booking so that you can see for yourself what a special bus this is. - Please note that the starting cost mentioned is for weddings. For proms, anniversaries, birthdays etc. a small discount will apply subject to distance and length of hire. - If booked for a wedding and the collection and drop off addresses are very close together then multiple journeys (up to 3) may be possible. Viewing of this bus is highly recommended prior to booking.